The Town of St Marys, Ontario gave notice 9 Jan 2008 that 135 Queen St E (Anstett Jewellers) will be designated an Ontario Heritage Property unless an objection is made within 30 days. 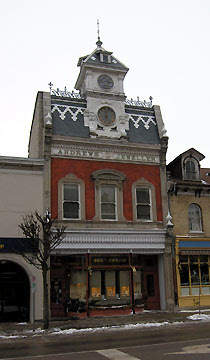 The stone and brick commercial building was constructed in 1884 for William Andrews, Jeweller, in the Second Empire style. It is an outstanding example of the work of local architect William Williams, and a showcase for the skills of local and area tradesmen. Unique original interior features are still in place. Its imposing storefront surmounted by the ornate clock and tower makes the building a focal point in the downtown core. William Andrews operated his first jewellery store for 15 years before building 135 Queen St E. His father was a stone mason who emigrated from Torquay, Devon to Canada in 1855 and came to St Marys 2 years later. William Williams was not only an architect but also the town clerk, private banker and the Anglican Church's choirmaster. Stone work on the building was done by John Grant who had previously been in charge of the masonry for St Marys Presbyterian Church. Plastering was done by Fred Patterson and painting and glazing was done by John Williard who 8 years later were contractors on the town hall.